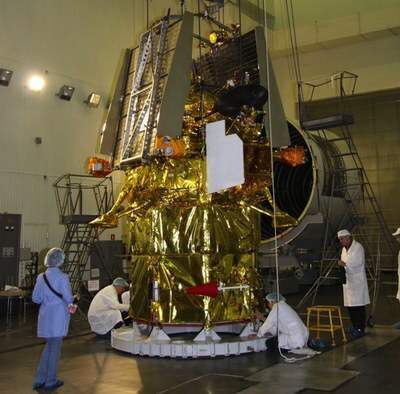 A Russian report blames space radiation for the failure of the Phobos-Grunt spacecraft (see here above during pre-launch preparations), but the report raises as many questions as it tries to answer (Credits: Roscosmos). With the release in Moscow on February 3 of the summary report from the investigation commission for the Fobos-Grunt debacle, the story has dropped from the news. But that is a pity because the report itself shows it is by no means the end of the story of this heartbreaking Russian space setback. If the official cause of the failure—cosmic rays knocking out two separate computer circuits simultaneously—is not accurate, then remedial actions and get-well measures will be inappropriate and very possibly ineffective. The Russian Space Agency has placed significantly difficulties in the path of foreign space experts trying to assess the report’s credibility. The report itself was released only in Russian, and in fact the Roscosmos website terminated its English-language news page back on July 25 of last year, with the advisory that “News updates in English won’t be available till November 30, 2011. We apologize for your inconvenience.” But three months later the English service has yet to resume. Hence there is no official English version of the Fobos-Grunt summary report. A rough machine translation was emailed to interested parties, from an unknown original source, and posted here but it has major problems in terminology, grammatical connections, and even a number of omitted “NOT’s”. Anatoly Zak has an excellent detailed discussion of the report on his website, but it is incomplete, and includes his highly-valuable editorial comments interspersed. The various attempted English translations (even two private ones that I am not allowed to publish) were all bedeviled to various degrees by misunderstandings of “space jargon”. One of them regularly mistranslated “TMI” [telemetry information] as “TV” signals. All translated the Russian word “kontrol”, which means passive monitoring only, as “control”, in its English sense of active alteration. They were baffled by the Russian word translated as “migratory”, which in NASAese is “cruise” phase. Careless decipherment of word case endings garbled the relationships of key nouns. Lastly, the numerous acronyms were often undeciphered. Based on my own working translation and on specific translated passages shared with me by Russian-speaking colleagues, I made a first attempt at assessing the conclusions for IEEE Spectrum magazine. That article relied heavily on the generously-shared expertise of NASA/JPL’s Steven McClure, the head of the Radiation Effects Group. McClure pointed out that the particular chip singled out by the report was one that never had been certified for space conditions, and would never have been accepted in any US design. Still, he concluded that the scenario where two identical failures occurred in parallel within two hours of launch to be “pretty unlikely”. McClure added: “Most of the times when I support anomaly investigations, it turns out to be a flight software problem.” That’s even though “it very often looks like a radiation problem.” But then a thorough investigation uncovers software branches that encountered unexpected situations and cratered the flight control system. McClure merely raised this possibility and did not have enough information to choose one way or the other. His opinion is widely shared within the Russian space community, and Zak has summarized the discussions of those experts—all of whom declined to let their names be used—on his own site. What is clearly missing is a continuation of the Russian news media interviews with internal space agency workers, including current and former specialists at the Lavochkin Bureau, which built the probe. In the days leading up to the report’s release there were a number of extremely interesting interviews, mostly without actual names used, that provided seemingly credible details of the ill-fated mission’s preparation and execution. These reports in the mass media have abruptly ceased, although discussion continues on private websites such as Novosti Kosmonavtiki. In the boisterous and occasionally free-wheeling world of the Moscow news media, that sudden advent of silence is unlikely to be accidental. The apparent termination of any permitted dissent from the official report may portend more serious problems in seeking the full story—and finding the effective fixes—for the Fobos-Grunt disaster. As a stepping-off point for further consideration, while awaiting more illuminating revelations from specialists within the Russian space industry, what follows is a discussion of other issues that caught my attention while reading the report. Issue 1: The title refers not to the mission of the probe but to the “процессе проведения летных испытаний”: the process of carrying out in-flight tests. The choice of this wording is initially baffling but I have been advised the wording is standard for the first flights of any new space vehicle—this remains to be documented, though. Issue 2: The report refers to direct transmissions and data replay “в зонах видимости наземных станций из состава НИК «РБ «Фрегат»”, [sic unbalanced parentheses], meaning in the zone of visibility of ground stations from the NIK RB Fregat. But some reports describe how the Fregat stage’s onboard computer was removed and its functions replaced by the main computer of the Fobos-Grunt, since the Fregat avionics were not qualified for a year-long interplanetary mission. Also, I am privately advised that the Fregat avionics remained in place and were only given instructions by the Fobos-Grunt flight computer, but were still capable of independent transmission of vehicle TM. The basic question remains: How much of the Fregat flight computer remained functional, and if the failure was in the main probe avionics, why did Fregat also shut down? Issue 3: The report refers to telemetry reception between 23:28:41 DMT (Decree Moscow Time – GMT + 4) and 01:10:28. This is a period of 102 minutes, and clearly must refer to two distinct contact periods separated by a long out-of-contact interval. Due to the Earth’s rotation, the time between successive recontacts would have been approximately 96 minutes, which would allow each of the two contact periods to have been about six minutes long, a reasonable duration. Launch was at 20:16 GMT, or 00:16 DMT, which conflicts with the report’s first contact time. Zak reported Lavochkin’s first contact was from 01:48 to 01:54 DMT, fully consistent with completing one orbit. First Fregat ignition was scheduled for 22:56 GMT [2:56 AM DMT]. Zak reported that the next expected pass, 03:20 to 03:35 DMT, received no communications. On that timeline, communications would have occurred between 00:27 DMT (when the spacecraft separated from the Zenit booster) and 01:54, the end of the first pass across Russia—an interval of 87 minutes, versus the 102 in the report. So I am having difficulty matching up the known event times with the report’s announced communication times. Issue 4: The report concludes that the probe entered “safe mode” and maintained solar orientation for some period of days after launch. However, it states that the power balance was disrupted on November 24 because the transmitter had not been commanded off after a communication session with a ground site (not specified if it is a Russian or ESA site). This led to the discharge of onboard batteries by November 29. This points to either a command error from the ground, which is unlikely since apparently there never was any successful ground commanding, or an onboard “safe-mode” related error (or some other error of unknown type) that failed to power down the radio, as the proximate cause of the irremediable loss of control of the spacecraft. The implications of either type of error on the actual health status (and failure mode) of the autopilot are not clear. Issue 5: Shortly after entering “minimum voltage” mode on November 27, the report states that one pressurized avionics bay lost pressure, resulting in the separation of fragments, two of which were observed by US STRATCOM. This loss of pressure must have been violent in order to detach fragments, two of which were large enough to be tracked. My speculation is the event could be attributed to explosion of one of the batteries, perhaps caused by unusual charge/discharge operation. But this is not further explained. Issue 6: Why depend on US tracking data at all? Russia has a significant spacetracking capability and the new unified “Air and Space Defense Command” was in the process of formal inauguration (on December 1). Were its own capabilities so minimal? Issue 7: The report speculated that thruster firing for solar orientation was the cause of orbital changes observed by US trackers (see this chart of “perigee creep”). These changes were noted and analyzed by Ted Molczan, and possible causes (including the one the Russians also decided on) were speculated about (see “The need for real “rocket science” to solve Russian spaceflight setbacks”, The Space Review, January 30, 2012). The problem is that the changes appear to have ceased by November 21, beforethe beginning of successful recontacts that only later inadvertently disabled the probe’s power system, leading to its loss of orientation control. So the operational cause of the termination of “perigee creep” is not explained. Issue 8: The report refers to the X-band receptions in the period November 22–24, without acknowledging that most of them were accomplished by European Space Agency, and not Russian, sites. 1. No deviations from the performance of their functions by the on-board systems and assemblies were uncovered before the appearance of the abnormal situation. The reason for the appearance of the abnormal situation is the restart of two subsystems of the TsVM22 [on-board computer] device which performed fight control of the Fobos-Grunt spacecraft in this sector of the flight, after which in accordance with the logic of the operation of the [on-board computer] there occurred a disruption of the regular sequence of the Fobos-Grunt spacecraft and it switched to the mode of maintaining a constant solar orientation, awaiting commands from the ground in the X-band, which was envisaged by the design decisions for the [interplanetary] flight trajectory. 2. The most probable reason for the restart of the two subsystems of the TsVM22 BVK device is local influence of heavy charged space particles, which led to a failure in the [RAM] of the computer modules of the TsV22 systems during the flight of the Fobos-Grunt spacecraft on the second orbit. The failure of the [RAM] might be caused by a brief inoperability of [electronic components] as a consequence of the influence of heavy charged particles on the cells of the TsVM22 computer modules which contain two WS512K32V20G24M chips of the same type located in a single housing parallel to one another. The influence led to a garbling of the computer code, which became the cause of the “restart” of the two TsVM22 subsystems. In other words, move along, folks, nothing to see here. The largest open item needing immediate attention is the absence of an authoritative English-language version of the summary report. Roscosmos is the agency directly responsible for producing this, and they should be encouraged to act constructively as soon as possible. Insofar as the translation also might address some issues raised in the discussion, above, it will be even more valuable. The compelling justification for demanding this disclosure is that Russia is no longer a lone-wolf actor in the world of space exploration. Numerous other nations provided hardware or mission support to this project, with substantial monetary and other resource costs to them. As far as the public record indicates, they have been offered no explanation for the loss of their contributions. The degree to which Russia participates in future international space projects, aimed at Mars or other planetary targets, or at other scientific puzzles, should largely depend on how far they are willing to emerge from Soviet-era secrecy, distortion, and fabrication of claims. Encouraging trends in honesty and transparency, detected in recent years, can still sadly be reversed by the kind of retrograde recidivism to the worst, discredited information-management policies of the lost and unlamented USSR. There’s too much at stake to passively tolerate those refreshing and welcome changes crashing back to Earth with the wreckage of Fobos-Grunt. More complete and credible disclosure about the probe’s failure must be released, or it will mark, not the beginning of a new era of Russian interplanetary exploration as intended, but instead the beginning of the retreat of the Russian space program from international teamwork and trust. James Oberg (www.jamesoberg.com) is a 22-year veteran of NASA mission control. He is now a writer and consultant in Houston. His series of articles relating to Phobos-Grunt can be found at http://www.jamesoberg.com/fobos_grunt.html This article was originally published by The Space Review on February 27, 2012. It has been republished with permission of the author and publisher.